Flip book is an amazing way to present PDF magazine. Compare with many page flipbook software, I think you are the best one. I have downloaded your program and install to my computer. The layout of Neat template is what I want. But there are many buttons display on the flipbook. Some of them are not much use, like "Sound On". How can I do to remove it? Thanks for your support. Actually, you can show or hide flipbook buttons by use of A-PDF FlipBook Maker. Please follow below steps. Step5: Click "Apply Change" to save all settings. 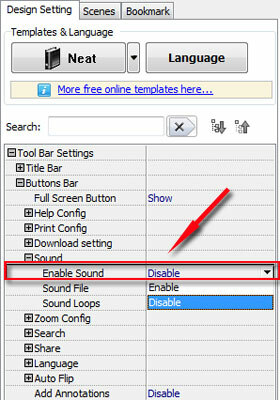 Notes: After that, sound button have been remove from the flipbook toolbar. If you need to show it again, select "Enable" option.